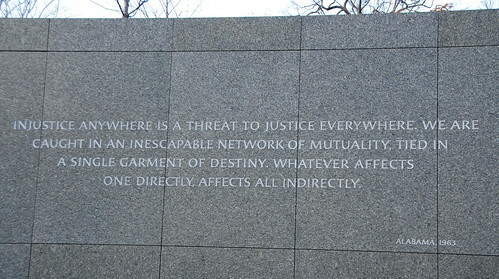 Today is MLK Jr. Day 2013. Tributes to the good doctor abound. I call your attention to the 2 most compelling that came through my Facebook newsfeed this weekend. The first is a video from King Tribute that came to my attention through Cultural Survival. I’m still trying to determine the video’s exact origins and provenance, even its purpose and the intent of its creators. It feels like a commercial or teaser for a longer documentary or an exhibit. However, its message clearly and succinctly communicates the importance of media and technology to social justice and activism. Do check it out. The second is a short article on how we can each honor Dr. King’s memory in big ways and small. By giving, learning, teaching, committing, and dreaming, we can all do things that serve ourselves and each other. I admit, what made these snippets compelling to me isn’t their originality of thought or the clarity of their calls to action. It was the serendipity of their timing. They came to my attention at just the right time, with just the right message. Now, what do these two MLK tributes, focused on social justice and equity, have to do with libraries and librarianship? Plenty.